ECO pH+ is specially designed for Pond and Aquaculture. This meter lets you perform pH tests on ponds easily, accurately and directly displays results in digital reading. No more color comparisons or dripping with color test kits. Because of the chore of such test kits, over dosage results while adjusting water pH, thus loading the water with harmful chemicals. With the use of ECO pH+, the user is able to make multiple tests per day, between small dosages for water adjustment. Most importantly, small water adjustment dosages will not shock the fishes which can result in fatalities. 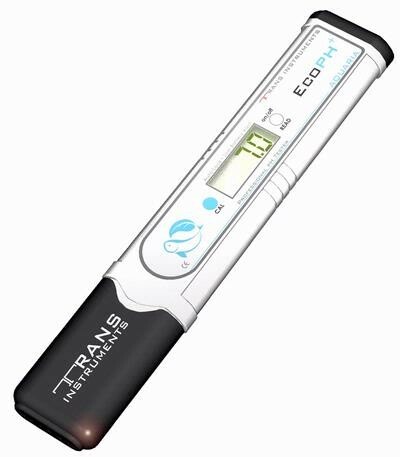 With such convenience and assurance, the ECO pH+ far surpasses the many tedious tests of cheaper liquid test kits. One-Touch Calibration- Effortless calibration with a single press of the button. Always calibrate accurately! Automatic Endpoint Reading & Calibration- Eliminates guesswork! The unit automatically locks to an endpoint reading during each test and calibration. Beep Function- Audible beep on every press of the button and long beep on every completed function and end-point reading. Auto-Off- The auto-off feature shuts off the tester when it's idle. Splash Proof- Testers are splash proof, allowing easy washing.